Decades ago, the Ilmari desert was the site of a massive war. The Crone Hegemony held Ilmari for most of the war, and they built massive bunkers -- bunkers that are now buried deep in the sand. But thanks to all the wind storms, different bunkers become available for a short time. Sir Johnson in Amulna hires local bandits to spot these temporarily-reachable dungeons, and then he asks you to go explore them. He's searching for a special metal that was often left behind. These are not instanced dungeons. There's only one version of each mini-dungeon, so it's possible for other players to be randomly sent to the same dungeon. But this isn't a bug, it's a feature -- an occasional opportunity to group up! Any quest items that come from monster loot are cloned for each person that loots it. This way you can fight alongside someone else without slowing each other down. However, since this is primarily a solo experience, all the "puzzle" mechanics are instanced. This means when you flip a lever to open a gate, only your version of the lever flips and only your version of the gate opens. We did this to ensure that other players can't screw up your puzzle, intentionally or not. The combat difficulty is mostly on the easy side, because we've found that lots of players are under-geared when they reach level 50. I sometimes imagine the average player reaching the Ilmari for the first time and thinking "I've done it! I learned to survive the frozen hellscape of Kur, I've reached level 50 in my combat skills, I'm ready for the desert! ... So what's in the desert? What do I do now?" And then they run into a pack of Drakeworms and are instantly killed. This is the sort of player that we're aiming the War Caches at: players with a strong knowledge of the 1-50 game, but who need a little more direction -- and more soloable game content! -- to reach the next tier of power. Each War Cache quest gives good loot during the quest itself, and in addition you receive a voucher from Sir Johnson that can be redeemed on equipment for specific slots. (This way if you're specifically missing a helmet or a necklace, you have a less-random way of obtaining one.) And while the quests do have the occasional tough monster for you to defeat, the directed nature makes preparation easier: if the quest tells you that you'll need to kill a tough monster, you can come prepared with potions, words of power, or whatever else you may need to get the job done. The "mini-dungeon" design also lets us do some fun things with interactivity that are impractical in large shared dungeons. The best example is probably the "Minotaur Chests", cryptic chests with clues scattered throughout the mini-dungeon. This is only really feasible because each dungeon is pretty small, so you have a reasonably-sized area to search. So yeah, that's the plan. We've made the first batch of them, and there's a lot to like. The variety is nice: each little dungeon might be wildly different than the last, with different types of monsters or environments that stress different combat skills (and play styles). I also like that they reward preparation a little bit. And I like the puzzle elements. And I like that it's short and contained. If you've got an hour to play, here's something you can do that's guaranteed to fit into an hour. And to add replayability when you're eventually sent to the same dungeon again, we've been adding some super-tough level 60 mini-bosses (curseless, of course) into the corners of some dungeons, to give a tougher challenge for those who are ready for it. Yep, definitely a lot of potential... which is why I'm still pushing to make these dungeons happen despite a lot of setbacks. On paper, making 20 to 30 dungeons in a month didn't sound too hard... wait, actually, it sounds completely insane in retrospect... so that's part of the problem right there. But beyond that, we're doing things in a new way, which means we're running into new hurdles in our development process. We've also discovered some new Unity limitations that we'd never run into before, which have forced us to change up our approach a few times. So it's been a bit of a slog, but we now have the first half-dozen War Caches fully complete, and a bunch more in various states of completion. Over the next couple weeks we'll finish as many of them as we can. Probably not 30 of them, but enough content for you to get the idea of how it works and give us feedback. This really is an experiment, and like many other parts of the game, your feedback will guide where we go from here. I think the basic idea has legs, but it might need all sorts of refinements before it really becomes fun. If players like them we might reuse this idea at higher level ranges, now that we've worked out the process for them. But if players find them kind of "meh", that's okay too. We'll probably just flesh out the level 50 ones and leave it at that. When you reach the Ilmari Desert, the combat difficulty goes up a notch. One of the ways you can counter that is the Transmutation skill. You can discover this skill if you wander the desert for a while, and I highly recommend every player learn it! Transmutation lets you "re-roll" treasure effects on your equipment, and it's a key tool in your quest for better gear. We're making some important improvements in the next update. First, the Transmutation Table will now show you a list of possible outcomes (and their percentages) before you transmute an item. The display is a little primitive for now -- I want to eventually have all of this information in an interactive format -- but the important thing is making the info easily accessible! In addition, we're tweaking the durability cost of transmutation, especially for lower-rarity items. I often play-test combat encounters using sets of Excellent gear (that is, "pink" gear with three random treasure effects). Higher-rarity gear is great, of course, but if you have a full set of Excellent gear with carefully-chosen treasure effects, I know you'll do fine. So I want it to be a lot easier to do that! This update will dramatically reduce the durability cost of Excellent-or-lower rarity items. Higher-rarity tiers are a little cheaper too. The next update also features major revisions for the Hammer and Lycanthropy skills. Well, the changes to the Hammer skill are important but not really too dramatic. Mostly they're numeric improvements and buffs to treasure. The most exciting change to me personally is the new treasure effects, including one that makes Pound to Slag deal tremendous extra damage to enemies whose rage is high, and one that makes Latent Charge discharge twice: once after 5 seconds and then again (for full damage) after 8 seconds. The changes to Lycanthropy are more in-depth. Werewolves are capable of dealing too much damage right now, so this update is a nerf to werewolves -- in particular, a nerf to their "burst damage" potential. But many other parts of the skill have been improved, making more combat builds viable and resulting in a more fun experience overall. Some of the changes are small but make a big difference, such as being able to eat corpses while "in combat". Some changes are quite dramatic, including some heavily-revised abilities and treasure. Many of these changes weren't made because of particular balance issues, but because I think the new ideas will be more fun. The thing I'm personally most excited about here is Shadow Feint, which is now a fully-controlled short-range teleport: you use it once to save your position, then use it again to blip back to that position. This is the way I'd envisioned the ability working originally, but I just couldn't implement it that way at the time due to game-engine limitations. It works now though, and it allows for some interesting new tactics. Plus, it's a great party trick. Nobody likes nerfs, but give these changes some time to grow on you. I think the updated skill will be less imbalanced and yet it'll also be a bit more fun overall. Yet another big thing in the next update: a new set of live-event tools that focus on interactive elements. These tools will let our admins create new kinds of dynamic experiences. The first version of any new system will need refinement and improvement over time, but I'm excited to see how these tools evolve! There are also some important client-performance fixes. For instance, we've optimized the UI so that having lots of "floaty numbers" on-screen doesn't cause your framerate to drop. We've also optimized Gazluk Keep's video-memory requirements. This should help players who "crash out" when trying to enter the Keep. What comes after this update? Well, our timeline for adding mounts to the game has slipped again due to some art issues that will take a while to work out. That's not really a bottleneck, though, just a production rescheduling: it means that more content will be arriving sooner rather than later! We're hammering out the details of several new outdoor areas, along with new game systems and mechanics that come with them. More on that when the details are a bit more solid. When you buy one of these packages, you receive a code via email. 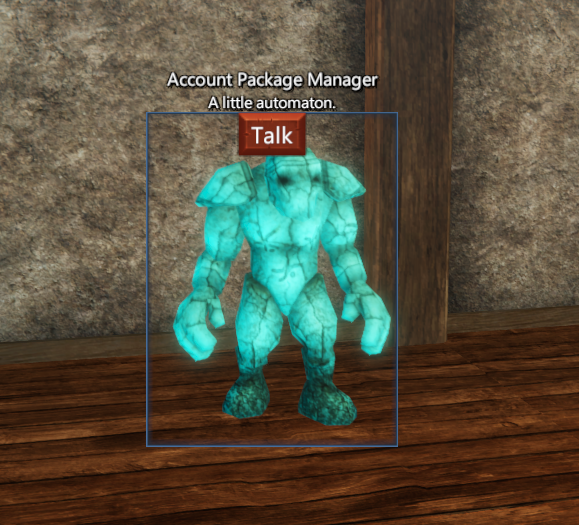 Then you log in to the game and visit a golem in Serbule, the "Account Package Manager". He's in the empty house next to Joeh's shop. The golem will prompt you for your code, and then it will ask for any needed information (such as the name of your horse, or the special title you want). You can change your answers by talking to the golem again. If your package includes a custom title, the golem will ask what title you want. Then we'll add that title to the game data for the next game patch. So it may take a few weeks to a month before your title is accessible in-game. Buying these packages help us a lot, and we really appreciate your supporting the game -- both financially and with your enthusiasm! Last edited by Citan; 04-02-2019 at 11:45 AM.